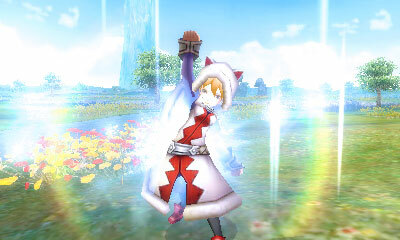 Plus, new screenshots of the 3DS action RPG. Square Enix updated the official website for Final Fantasy Explorers with new details and screenshots on its upcoming 3DS action RPG. The new information sheds more light on the game’s world, the Crystals that inhabit it, and some of the areas players will visit, including the hub town of Libertas. From the rapid movement of the earth’s crust, a new island called “Amostra” was born. An enormous amount of “Crystals” are buried on the island of Amostra, and those who gather them are called “Explorers.” One by one, they set foot on the island. However, the beasts who protect the natural world stand in the way of the Explorers trying to gather the Crystals, making it a difficult voyage. The stars are the source of energy, which is being drained away by mystical crystals. All life on this planet has been bestowed with souls of their own by the blessings of the “Crystals,” in turn evolving over time. And now, humans have used the power of these lives to develop their civilizations. Libertas (Home Town) – The home base of the story. Here, Explorers can accept jobs that can be carried out in various regions. There is also all kinds of shops and an “Airship” to take you to different areas. At the center of the city is a giant crystal, of which there are different ways to make use of. Regi Plains – An area players will visit early in the game. At the depths of the plains, you’ll find a crystal known as the “Grand Crystal,” which is said to be the origin of this world. By the energy of said crystal, the human race has developed. Hibato Volcano – An area filled with magma. Within these flames of purgatory, the beast Ifrit lies dormant. The series’ familiar Bomb monster also lurks here.